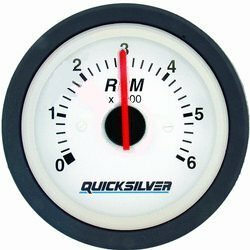 There are basically 4 different styles of standard Mercury Marine Gauges. Most Speedometers come in ranges of 10-45 MPH, 15-65 MPH, 20-80 MPH and 20-100 MPH. All gauges are 12 volt DC. Small size gauges fit in a 2-1/8" hole. Larger gauges fit in a 3-3/8" hole. Gauges are sold in either basic sets or individually. We also have the full line of Livorsi (Gaffrig) and SmartCraft gauges and harnesses. If you need any sender units, let us know what engine your have. 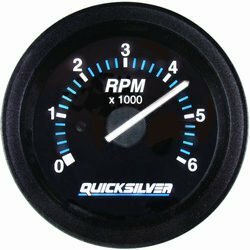 There are many different possible gauge configurations. don't be surprised if the new gauge is a little different. It is best to email us a photo of your old gauges as so we can match it as close as possible. EMAIL your gauge request to us. Attach a photo if possible.